Hi, my friends. Today, I present about the ELF (Executable and Linking Format) format and introduce some tools. There are three main types of file: Relocatable file, Executable file, Shared object file. 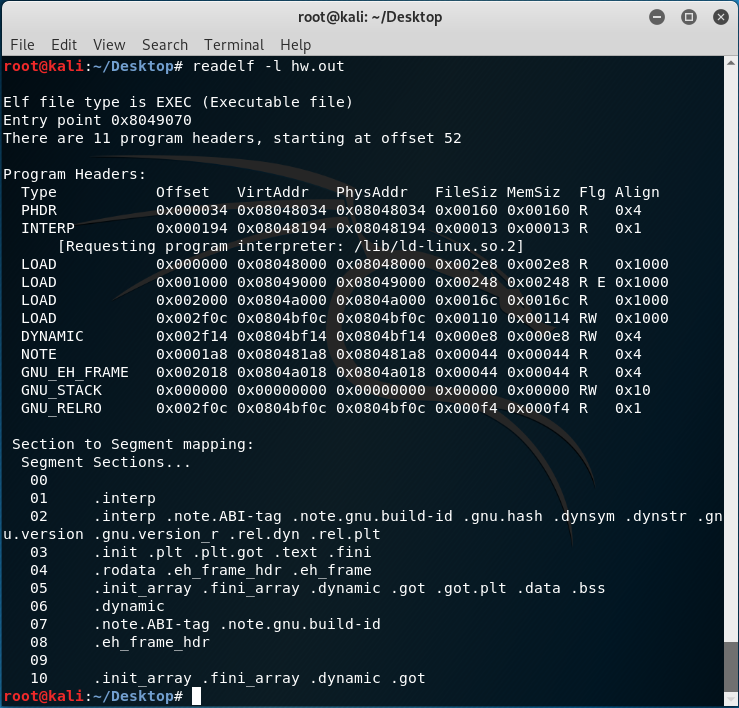 Use gcc -no-pie to make an ELF executable file. 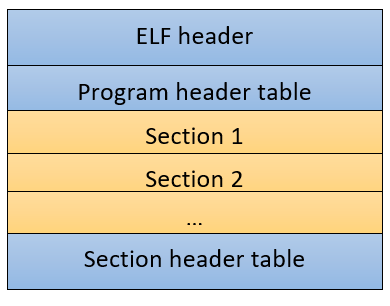 The ELF file usually has four main components: ELF header, program header table, sections, section header table. 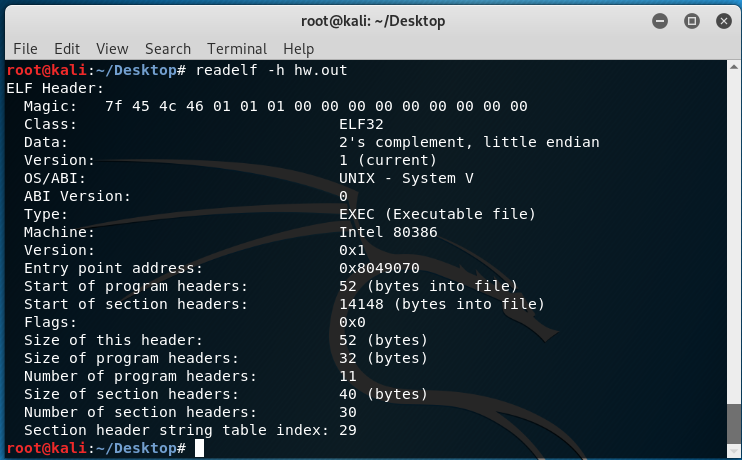 The ELF header is located the beginning of the file. 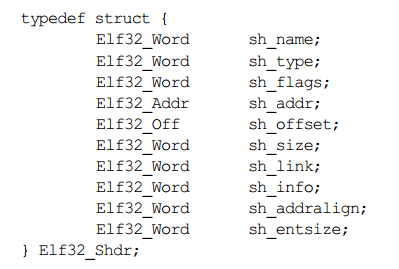 The first field in the ELF header struct is e_ident field and it marks the file as an ELF file, provides machine-independent data with which to decode and interpret the file’s contents. 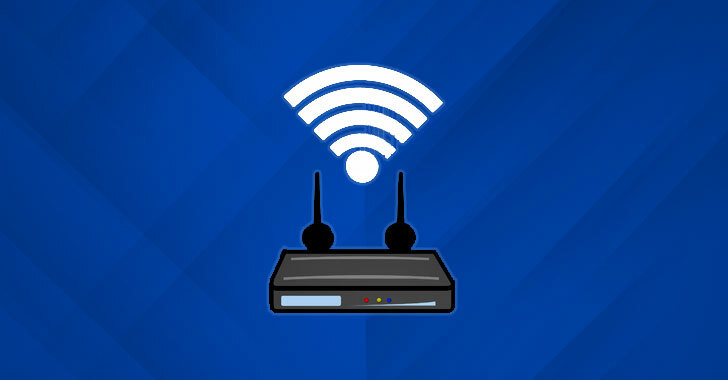 The e_entry gives the virtual address to which the system first transfers control ( entry point). The e_type identifies the object file type. Type ET_CORE is reserved to mark the file having unspecified contents. 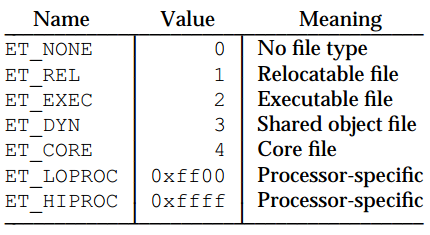 Values from ET_LOPROC through ET_HIPROC are reserved for processor-specific semantics. * The .text section: is a code section that contains program code instructions. * The .rodata section: contains read-only data such as strings from a line of C code. * The .plt section: contains code necessary for the dynamic linker to call functions that are imported from shared libraries. * The .data section: will exist within the data segment and contain data such as initialized global variables. * The .bss section: contains uninitialized global data. * The .got section: contains the global offset table. * The .dynsym section: contains dynamic symbol information imported from shared libraries. * The .dynstr section: contains the string table for dynamic symbols that have the name of each symbol in a series of null-terminated strings. * The .rel. * section: contain information about how parts of an ELF object or process image need to be fixed up or modified at linking or runtime. * The .hash section: contains a hash table for symbol lookup. * The .symtab section: contains symbol information of type Elf_NSym. 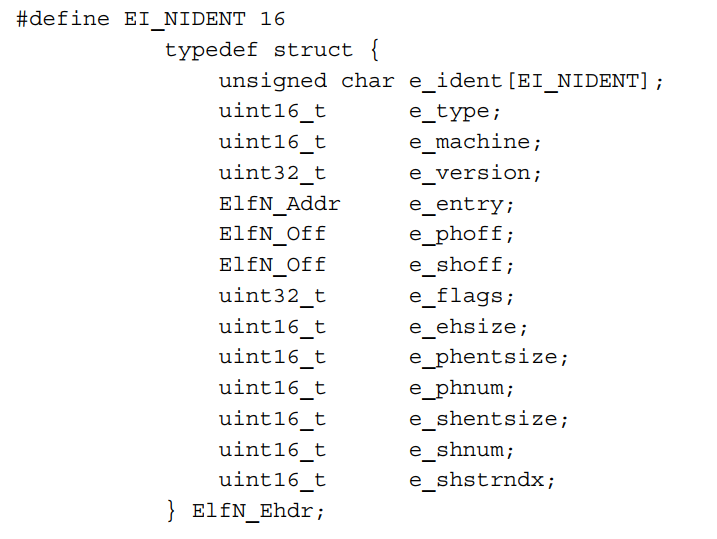 * The .strtab section contains the symbol string table that is referenced by the st_name entries within the ElfN_Sym structs of .symtab. * The .shstrtab section contains the section header string table. The section header table is an array of structures as described above. A section header table exists to reference the location and size of these sections and is primarily for linking and debugging purposes. Section headers are not necessary for program execution, and a program will execute without having a section header table. The readelf -S command will show the file’s section header table and the readelf -l command will show which sections are mapped to which segments. 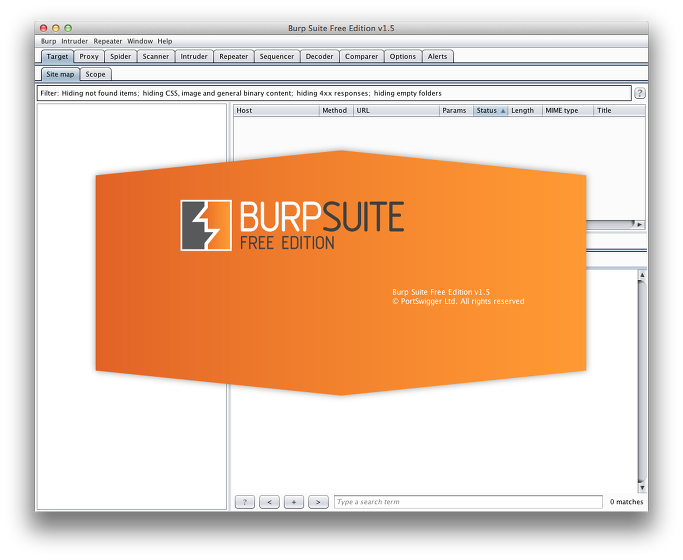 This is a useful software. It provides GUI tool to work with ELF file. 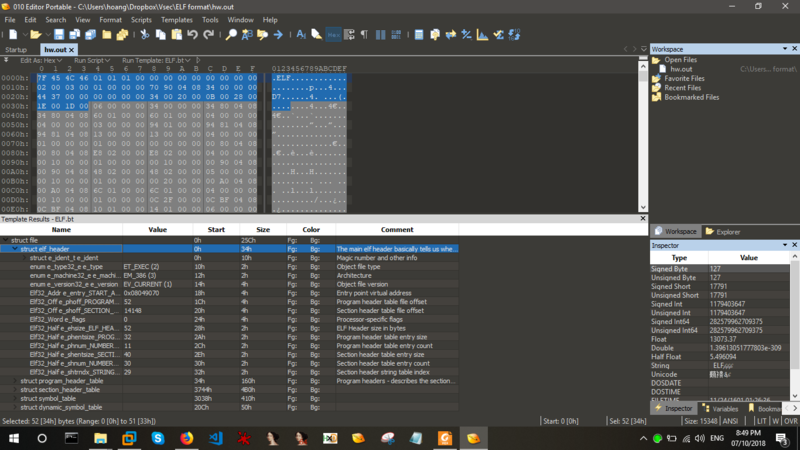 Unlike traditional hex editors which only display the raw hex bytes of a file, 010 Editor can also parse a file into a hierarchical structure using a Binary Template. 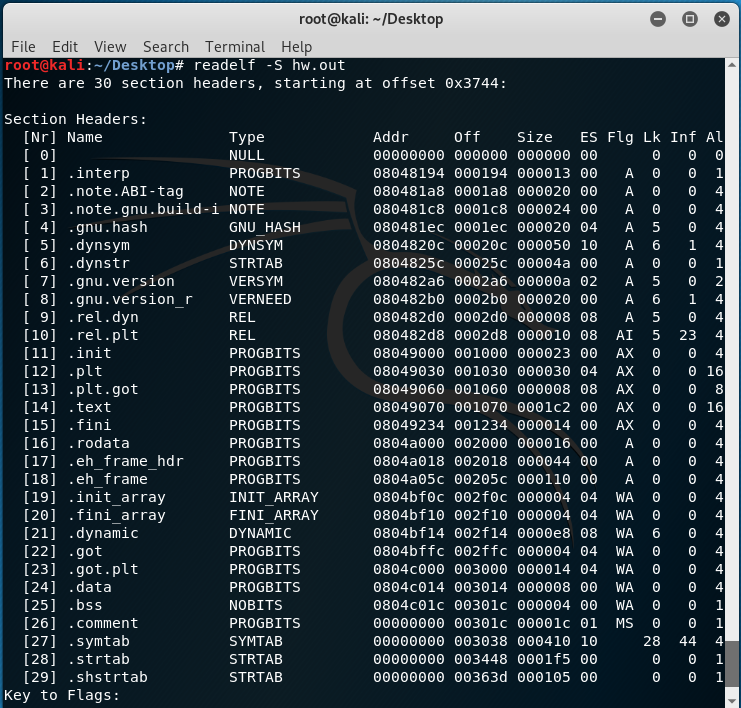 The readelf command is a the useful tool that provides every bit of the data specific to ELF necessary for gathering information about an object before reverse engineering it. The ftrace is similar to ltrace, but it also shows calls to functions within the binary itself. ERESI contains a suite of many tools for analysing a Linux binary, which is capable of code injection. Unfortunately, many of tools are not kept up to date and aren’t fully compatible with 64-bit Linux. You can install ERESI follow the below instruction. In this chapter, I present the basic format in an ELF binary file and introduce the analytic tool. The next chapter, we will explore the program loading process and the dynamic linking.